30-day guitar challenge: Used in every style of music from blues to soul and metal, the minor pentatonic scale is one of the most common scales. Most guitarists know one easy-to-remember pentatonic scale shape, known as 'shape one'. In reality, the minor pentatonic scale can be found all over the neck. 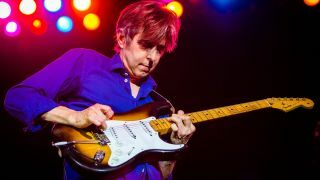 Modern blues-rooted players such as Eric Johnson and Joe Bonamassa pepper their blistering solos with pentatonic runs that cross the entire fretboard. They do this by having a framework of connected scale shapes that they can improvise around using a combination of picking, legato and slides. This lick spans four octaves of the A minor pentatonic scale (A C D E G). Bar 1 features the same five-note scale fragment played in three different octaves, and is played with five evenly spaced notes per beat. Remember to check your tempo when you start and when you return to measure your progress. You can only play fast when you know where your fingers should be going, so thinking ahead is of utmost importance. With a lick such as this, your mind should be two notes ahead of your fingers, so try to memorise the shapes we've used. Start each exercise slowly and play to a metronome or drum loop for 30 seconds, before increasing your tempo in 5bpm steps. Keep your first two fingers as far apart as possible to make stretches more comfortable. Try not to let your fingers become stuck next to each other. This is the moment when your hand shifts up the fretboard. Move your hand up two frets and plant your first finger on the fourth string in one smooth motion. Hammer on the first three notes and continue the upward movement so your first finger arrives naturally at the 10th fret. These three licks will give you some different perspectives on applying pentatonic runs to fast lead playing. The blues example features an upward sliding sound, which covers five pentatonic scale shapes, whereas the rock example takes a string skipping approach. Finally, the shred example stays in one fretboard position, but uses a fast descending flurry of notes for an ear-catching cascading effect. Play this entire lick using just your first and third fingers - it's the easiest and quickest way to navigate the notes. String slides (shown with diagonal lines in the notation and tab) are often used in pentatonic licks as a way to make position changes quicker and easier, so we've included a few here. Start this lick with your first finger at the 5th fret and play the 6th string, then the 4th string, skipping over the 5th string entirely. You can articulate the notes with your pick or you can use hammer-ons. Move up to the 5th string and repeat the shape at the 7th fret, then move up to the 10th fret, adjusting the shape to fit the scale. This lick is played at a rate of six notes per beat throughout and uses pull-offs for a smooth, fluid sound. Practise the first six notes slowly and notice that it is actually made up of two smaller three-note phrases. Once you're comfortable with the opening phrase, the same pattern repeats across all six strings.